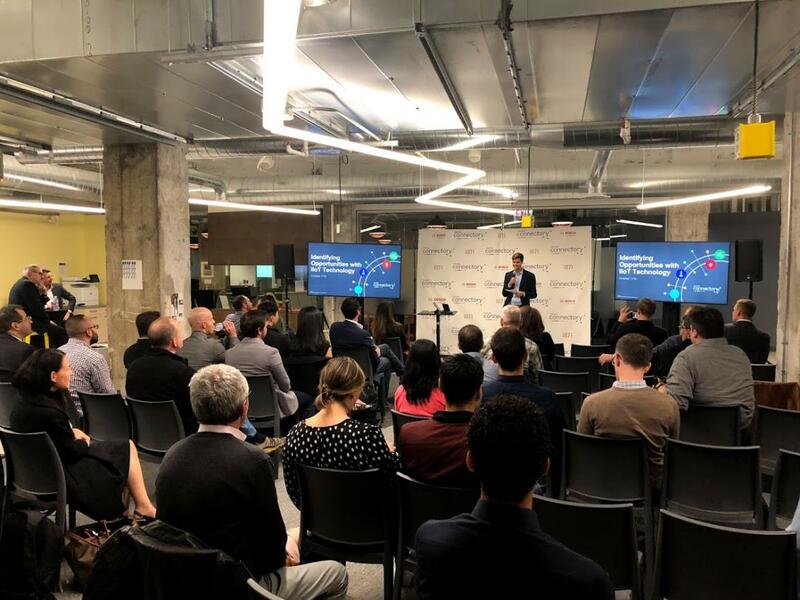 On Thursday, October 11, approximately 50 participants joined a thought-provoking session about Industrial IoT Technology at the Chicago Connectory. After an engaging networking session with pizza and drinks, the presentations kicked off. Five industrial manufacturers presented and discussed their use cases for Industry 4.0. The first was Amper. Amper provides a simple solution for real-time production monitoring using sensors. Their simple device has a plug-and-play installation and uses completely non-invasive sensors. The Co-Founder & COO, Sachin Lal, presented the case study where Amper enabled one of its clients’ to transition to lights-out manufacturing at one of their factories. Next was Nozomi Networks. John Almlof, the Director of Strategic Alliances and Business Development Americas at Nozomi, discussed real-time network monitoring. The audience learned about this leader in industrial cybersecurity and how Nozomi delivers the best solution for real-time visibility to manage cyber risk and improve resilience for industrial operations. With one solution, customers can gain advanced cybersecurity, improved operational reliability and easy IT/OT integration. Tomas Subatis, responsible for strategic sales at Tulip, presented next. Tulip is a manufacturing app platform that empowers process engineers to turn workflows into instrumented, data collecting, digital processes that increase productivity, quality and efficiency, without any complex system integrations. Adam Tilton, CEO at aktive.ai, presented its software and services next. With aktive.ai, machine learning has real-time data processing, reduced costs of data transfer and storage, increased applications efficiency and improved security and compliance. The last presentation was presented by Matteo Dariol, Senior Solutions Architect at Bosch Rexroth. He pointed out how Rexroth identifies opportunities with IIoT as a leading provider and a leading user. The Bethlehem site was used as the use case where innovation met connected solutions in a multi-product line (MPL). The proposed solutions included a light guided system that makes it easier to find the operation place; autonomous material delivery that automatically orders materials when they are low; automatic torqueing which reduces human errors; and RFID that allows full visibility and traceability.